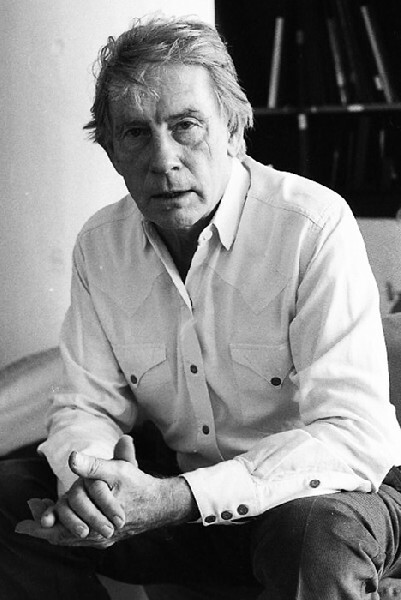 Lester Johnson discussed his work during a series of interviews in 1986. Giuliano photos. He discussed unique ideas about teaching life drawing at Yale. The Temptation of Saint Anthony by Jan Muller was included in the MoMA show New Images of Man a year after he died. 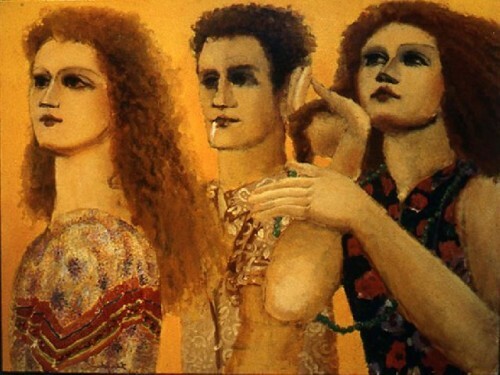 Bob Thompson painted high chroma, linear, figures inspired by the Italian Renaissance. 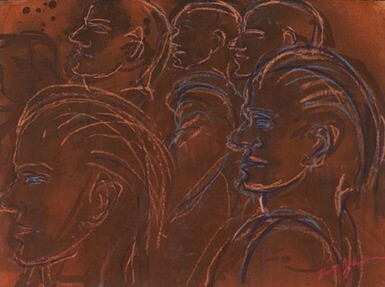 From Johnson’s series of heads in the Lannan Foundation collection. Blue Man 1962. Photo courtesy of David Klein Gallery, Birmingham, Michigan. Deaccessioned from the Rose Art Museum, 1960s. 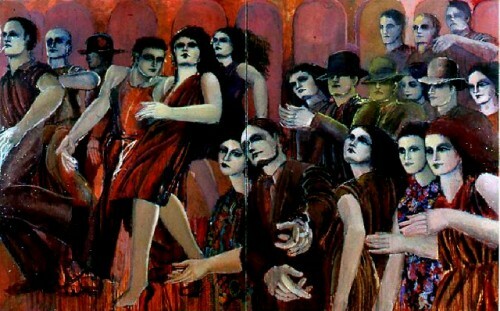 Lester Johnson (January 27, 1919 to May 30, 2010) was one of the leading exponents of Figurative Expressionism. The movement which included artists in New York, Provincetown, Chicago and San Francisco emerged in response to the non objective aspects of Abstract Expressionism. While it flourished during the late 1950s and early 1960s it coincided with and was overshadowed by Pop art. 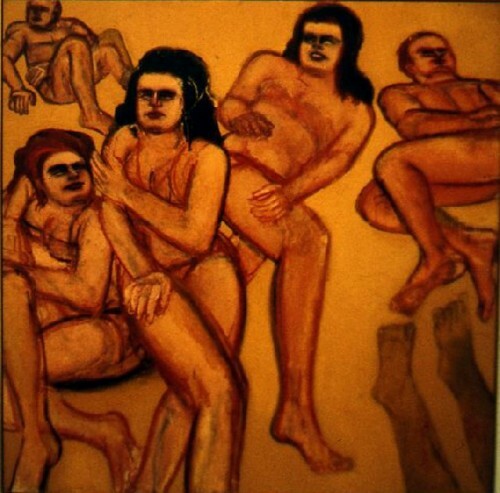 There are many versions and interpretations of Figurative Expressionism. The lists appear to expand and contract with little or no consensus among curators and critics. Despite some key artists the movement is widely viewed as marginal. There has been some cherry picking as individual artists have been researched and shown. But cohesive study, exhibitions and publications remain unrealized. While there have been isolated exhibitions and catalogues they tend to further obfuscate a complex history. 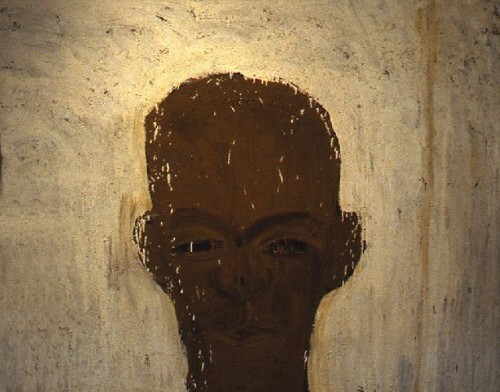 In 1986 I was asked to write an essay on Johnson for a traveling exhibition organized by Paul A. Chew the director of the Westmoreland Museum of Art in Greensburg, Pennsylvania. The project was coordinated by Carl Hecker the director of the David Anderson Gallery. There were meetings in the warehouse of the gallery which was in essence the estate of art dealer Martha Jackson. 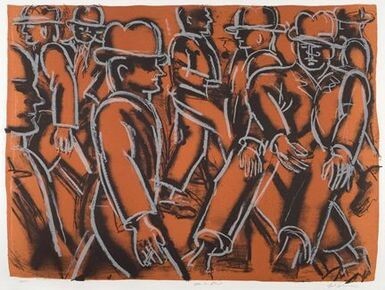 She had represented Johnson as well as the African American artist Bob Thompson (1937-1966). It was Lester who urged Jackson to show Thompson’s work. Over several months I met with Lester in New York and his Connecticut studio. In addition to researching his work we also discussed the “return of the figure,” the debates of the Artists’s Club in New York, and the exhibitions of the Sun Gallery in Provincetown. Lester was frank and insightful in providing a narrative of his own development and relationship to peers. 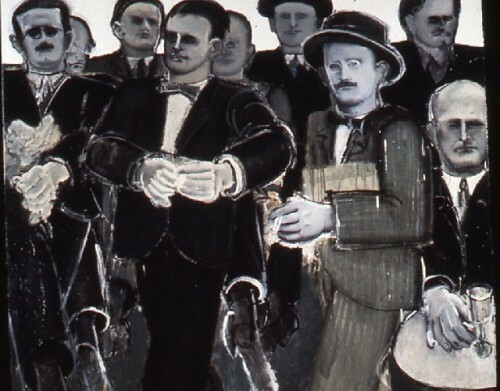 I came to conclude that he along with Jan Muller (1922-1958) and Thompson were the leading figurative expressionists of the Provincetown/ New York school. My research led to exploring parallel developments in San Francisco focused on David Park (1911-1960), Richard Diebenkorn (1922 to 1993), Nathan Oliveira (Born 1928) and Joan Brown (1938-1990). 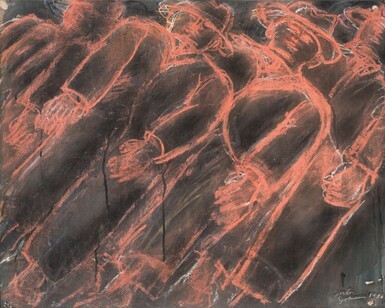 There were strong parallels to the early work of Leon Golub (1922-2004) in Chicago. 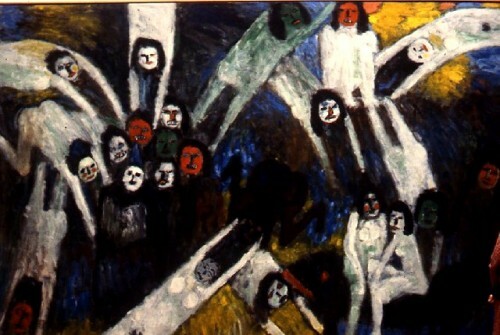 A major challenge entailed tracking the course of Figurative Expressionism as a tributary of Abstract Expressionism. Looking back at that era in the late 1950s and early 1960s it is important to consider the passion with which movements and their differences were discussed and debated. Reading a leading critic like Clement Greenberg today seems rigid and fundamentalist. He was espousing abstraction as a form of religion. 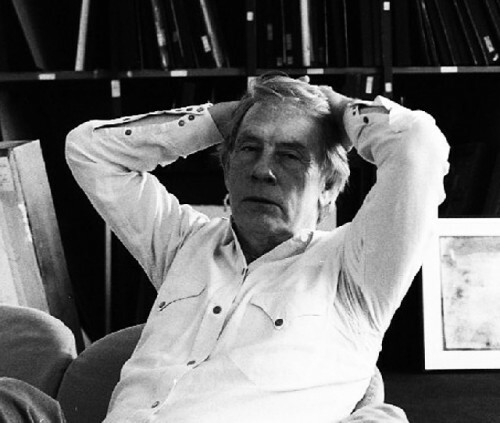 Willem deKooning (1904-1997) was deemed lesser than Jackson Pollock (1904-1997) because he never freed himself from the figure. 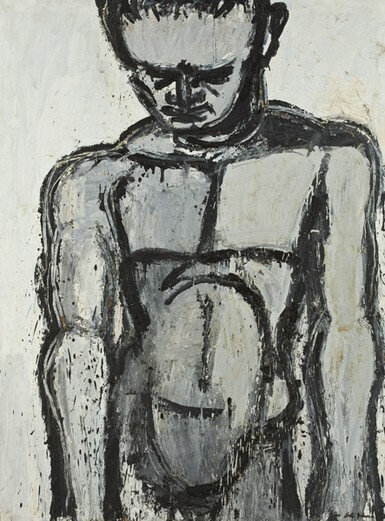 Greenberg apologized for Pollock’s late works in which the figure is evident. The purity of Greenberg’s dictums of abstraction conformed to the development of Color Field Painting and Formalism. Compared to which all else was anathema. With the curious exception of the now largely forgotten Horacio Torres (1924-1976). 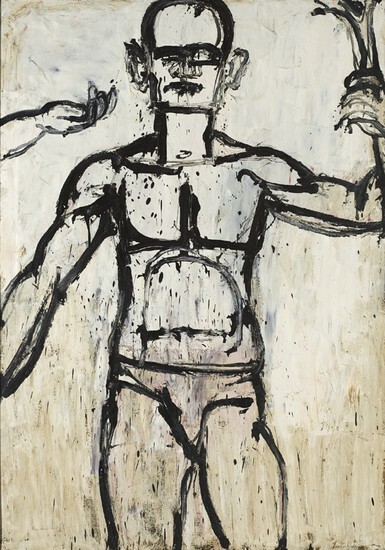 The debate and speculation about a return to the figure among avant-garde artists came to a head when Peter Selz organized “New Images of Man” for the Museum of Modern Art in 1959. That seminal exhibition offers few clues to the dialogue that prevailed with such passion among American artists. Selz conflated European and American masters. On the A list there was an interesting face-off pitting Francis Bacon, Jean Dubuffet, Alberto Giacometti and Cesar, among others, against the Americans Pollock and deKooning. 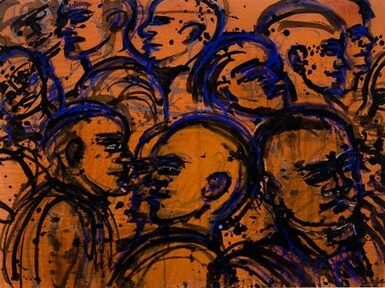 Among the Figurative Expressionists he included Muller (by then deceased), Diebenkorn, Golub, and Nathan Oliviera. He flew wide of the mark with Leonard Baskin, Balcomb Greene, Rico Lebrun, Germaine Richier, Theodore Roszak, and Fritz Wotruba. They are artists more favorably regarded then than now. An exception was his inclusion of the eccentric H. C. Westermann. Of the curators of his generation Selz had the best shot of defining the artists of the Figurative Expressionist movement but he blew it. When MoMA gets it wrong that stifles efforts to correct the mistakes. Shortly after that exhibition Pop art dominated the New York art world. Collectors, curators, critics and gallerists dumped Abstract Expressionism in a scramble for Pop. The signifying drip of Abstract Expressionism took on an ironic, sardonic twist in the early works of Jasper Johns and Robert Raushenberg. Roy Lichtenstein later transformed the signifying, fluid brush stroke into a hilarious cartoon. If Abstract Expressionism was pushed aside Pop utterly buried the simultaneous emergence of Figurative Expressionism. With no major museums, curators, critics or galleries to take up the cause they were left to their own devices. In Provincetown there was lively activity at this time with the legendary Sun Gallery. During the post war era artists flocked to the Lower Cape. Many studied with Hans Hoffmann and Henry Henche. They lived in shacks in the dunes, dug clams, and washed dishes in restaurants. Two of the artists founded the famous Ciro’s and Sal’s. There were exhibitions and panel discussions at the Provincetown Art Association. One of the most famous of these was the summer long Forum ‘49, in 1949. When the focus of Figurative Expressionism faltered the Rhino Horn movement was active from 1967 to 1978. 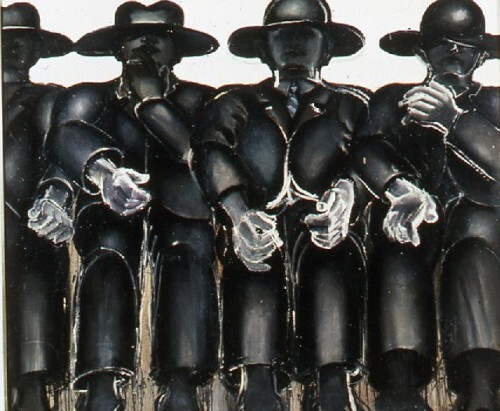 These artists included: Benny Andrews, Luis Cruz Azaceta, Ken Bowman, Emilio Cruz, Peter Dean, Stuart Diamond, Mary Frank, Lionel Gongora, Joseph Kurhajec, Charles Parness, Peter Passuntino, Peter Saul, George Segal, and Nicholas Sperakas. 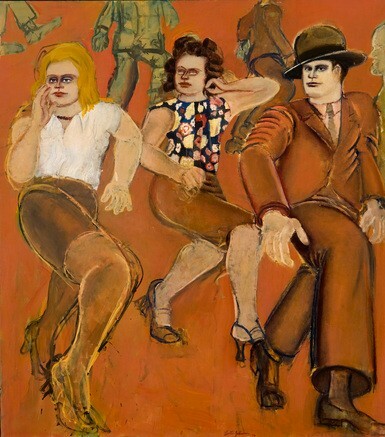 Of the first generation of Provincetown/ New York figurative expressionists the most important were Johnson, Muller and Thompson. Jan Muller died at 36 in 1958 and Bob Thompson was dead at 29 in 1966. Arguably Muller and Thompson were among the most gifted, inventive and lyrical artists of their generation. One may only speculate the impact had they sustained through longer careers. While Johnson died at 91 the mantle of leadership rested uneasily on his shoulders. For his exhibition catalogue I endeavored to place him in context. Much of the material that appears above was included in an introduction. Through his daughter, Leslie DeTroy, I was informed that “Lester feels very strongly, however, that the ‘introduction’ section would be fine for a magazine article on art in general, or a book, but does not belong in a Lester Johnson catalog.” (From a letter, November 20, 1986). Then and now, however, it seems important to place the work into an historical context. Without this connective tissue the tendency is to view him as an eccentric or maverick. He was neither. In his formative years Lester was in the thick of the zeitgeist. It’s what informs the passion, energy, and enduring power of those early primitive works. There was angst and reckless risk taking. I feel something demonic in the frenzied execution of the early heads and figures. Taking from the Abstract Expressionists he painted from the shoulder in broad, messy, drippy strokes. From that period is a video tape he gave me in the act of painting. It was an all out, intuitive, unthinking train wreck of an attack on the canvas. All of his guts and energy went into the frenzy of the creative act. There was no time or place for thinking and theory. Even today those early works blow me away with their fury and originality. The Lester I came to know in the mid 1980s was very different from the glimpses of manic agita in that clip of vintage film. He was emotionally and financially comfortable. Even somewhat guarded and sedate. His unique approach to painting the figure had been filtered and formulated. He was an adjunct professor at Yale University. There were interesting ideas of teaching life drawing. The students were asked to draw with both hands or to start with the foot and work their way to the head. He was trying to break up the usual instincts. To evoke oblique and fresh approaches. The secure life of a professor drew him away from the conflicts of the city. 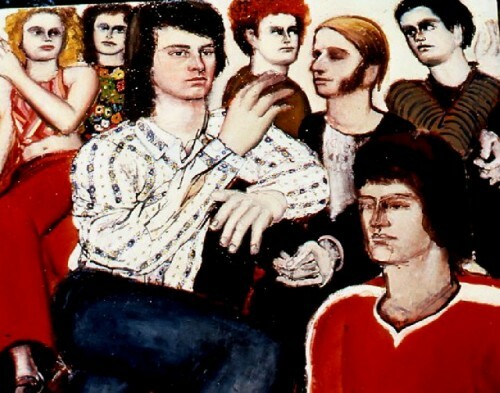 The Bowery, where he shared a studio with Larry Rivers early on, had been the source of inspiration and conflict in the work. There were the surging cityscapes, and cavorting Men in Hats. The urban environment was a locus for his inspiration. They were invented rather than observed figures with an emphasis on mass and volume. The figures were smashed into the space as rakish angles. There were vectors as they deflected humanistic impulses. Lester was striving to find the essence of universal man. The details and specifics failed to engage him. The figure was a metaphor for the turmoil and conflict flowing through him. The resultant works were among the most potent conundrums of his generation. Even now there is no consensus on what to think about them. The trajectory from Skid Row and cold water flats to Greenwich, Connecticut and summers in East Hampton is vividly evident in the work. The generic bowler hats and boxy suits evolved into Yankee’s baseball caps. The strongly rendered, angular women became attired in the printed fabrics of designer Emilio Pucci. They intrigued Lester for their color and design. The profiles and soft, flowing hair of the women edged ever more to the classical. If his youth was devoted to Dionysus in later years he succumbed to Apollo. East Hampton inspired him to depict bathers on the beach. In 1954 Johnson showed with the Marvin Korman Gallery. The following year the stable was merged with the Virginia Zabriski Gallery. In 1962 he was taken on by Martha Jackson Gallery. In more recent years when David Anderson moved out of New York he returned to Zabriski. For the past few years Johnson has been with the David Klein Gallery in Birmingham, Michigan. 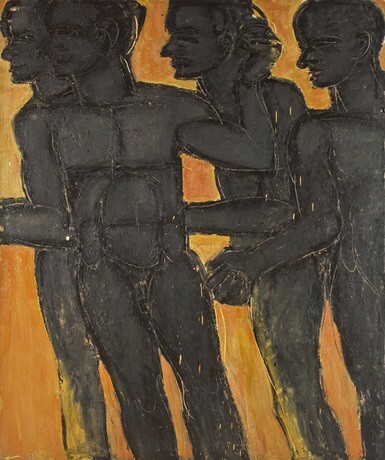 Adam Zucker, a young scholar of the Figurative Expressionist movement, reviewed for us Klein’s recent exhibition of paintings from the 1960s. The gallery is in the process of negotiating to represent the estate. They were generous in allowing us to post many of the images that illustrate this article. A change in Johnson’s work occurred in 1951. Over a two week period he was using a mirror to paint a self portrait. One afternoon he painted out the image. “I was free to start again” he recalled. “I had three colors on my palette and started making diamonds. 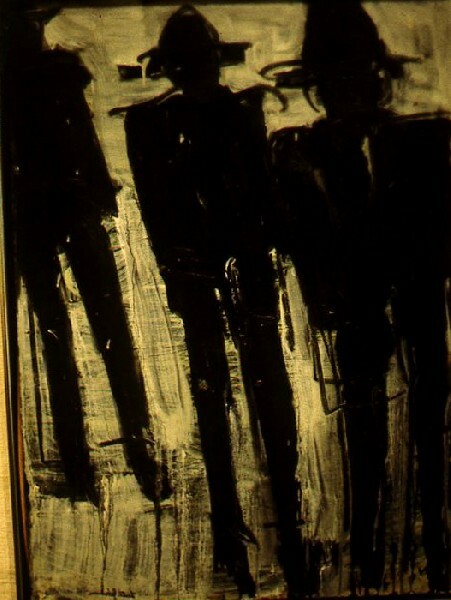 Two on the top, two on the bottom, and two on the sides, one in the middle.” He realized that it was about his family and that “I was the one trapped in the middle.” I asked Lester if he still had that painting but it never surfaced. In the Kramer piece in the New York Observer (October 24, 2004) he quotes a Dore Ashton catalog statement. She wrote that the change to expressionism occurred when Johnson saw a Giacometti exhibition at Pierre Matisse Gallery in 1948. Lester never mentioned that to me. I do not know if any work of that period survives. 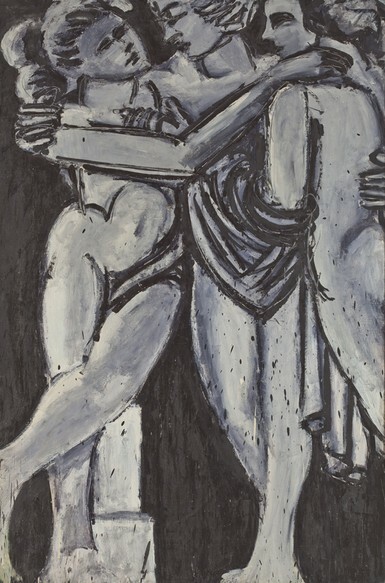 Kramer compared the paintings of Johnson to the paintings and sculptures of Giacometti. It strikes me as an apples and oranges argument. 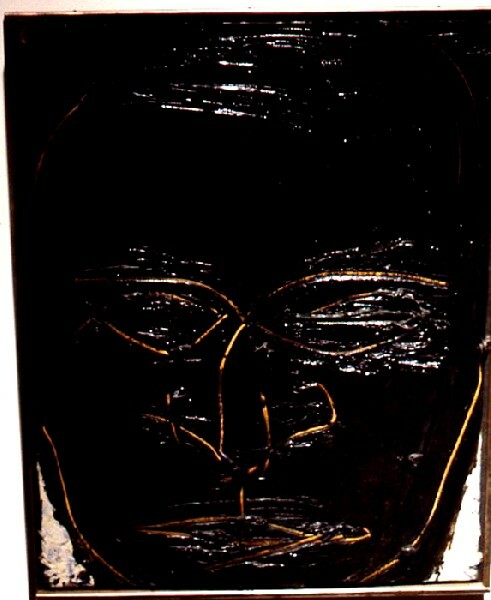 There is a visceral series of heads mostly in small scale owned by the Lannan Foundation. J. Patrick Lannan, like Walter Chrysler and Joseph Hirshorn, was noted for buying the content of an artist’s studio at bargain basement prices. While it exploited cash strapped artists this also had the result of preserving key periods in depth. During annual visits to Palm Beach to visit my mother I always enjoyed driving over the Bridge to West Palm Beach. The Lannan Foundation occupied a former movie theatre. There were many curiosities. This included an important series by Johnson. They were almost minimalist monochromes (from the 1960s) in which the features were scratched into the paint. Now that the Foundation has moved I don’t know what has become of these works. There was an intriguing transitional series by Morris Louis on the cusp of developing Color Field painting. Lannan also bought early work by Julian Schnabel and Robert Longo. During the 1950s Abstract Expressionism dominated the New York School. The artists hung out at the Cedar Bar in Lower Manhattan. During a Spring break from college, around 1960, I sought out the famous artist bar. I was expecting to run into deKooning but it was just a quiet night. After a couple of beers I moved on to the Café Wha. Decades later Irving Sandler told me about how he ran the panels and lectures at the Artists’ Club. Lester was a member. Although Johnson and Thompson were not included in New Images of Man they were increasingly respected in the community of artists. In addition to the art world Thompson was hanging out with jazz musicians. His masterpiece Garden of Music (6 x 12’ the Wadsworth Athenaeum) depicts an ensemble of avant-garde musicians including Ornette Coleman and Charlie Haden. 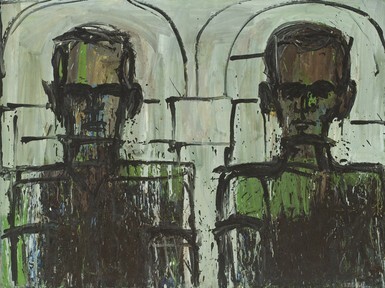 From 1961-62 Johnson accepted a position as Artist-in-residence at Ohio State University. As he conveyed to me it was the wrong time to be out of town. When he returned everything had changed. It was precisely the moment when Sam Hunter, the founding director of the Rose Art Museum acquired some 25 works with about $40,000 from the Mnuchin and Gervitz families. 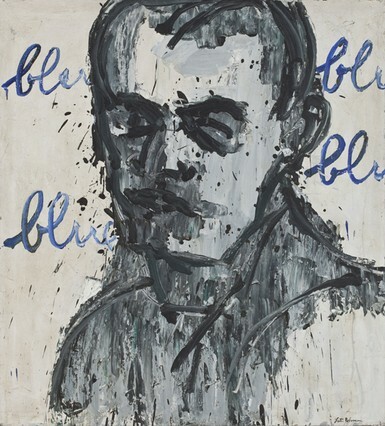 Hunter hedged his bets with acquisitions of Abstract Expressionism, Color Field, and Pop Art. Significantly, he ignored examples of Figurative Expressionism. It was the Pop selections that are now evaluated in the millions. Prime examples of Figurative Expressionism from that period are estimated in the low to mid six figures. By 1964 Jack Tworkov the chair of the department recommended Johnson for an adjunct position at Yale which continued until 1989. 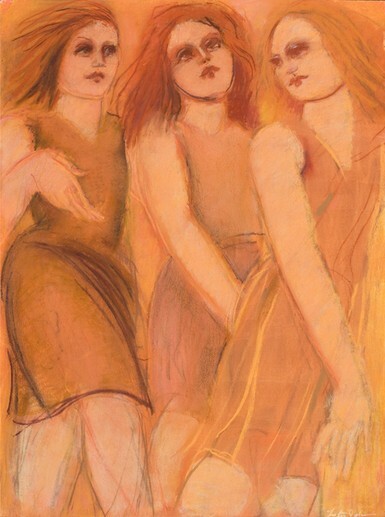 From 1969-1974 he was the Director of Studies for Graduate Painting. After that frustrating attempt at a self portrait in 1951 Johnson rarely painted from observation. In 1971 James Joyce surfaced in an ensemble of men in hats. There is a portrait of his son Tony. By the 1980s the figures and costumes were more decorative and representational. But as Kramer correctly observed he resisted becoming too facile. Arguably he was picking up details of the world he lived in. From the t-shirts of Tony and his pals to the colorful dresses of the social circuit in Connecticut and East Hampton. In the 1965 book “The Success and Failure of Picasso” the critic John Berger discussed the negative impact when an artist is isolated from his peers. Wealth and fame built a wall around Picasso. 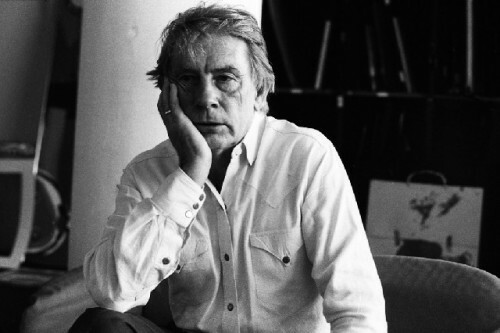 With Lester a self imposed isolation from artists and the mainstream was a personal choice. I found him comfortable, almost bourgeois. He seemed to have little interest in the art world which largely returned the favor. There was an understated resentment about being passed over. And yet, as I stated with disappointment, he resisted having his work discussed in comparison to and in context with other artists. "Thank you, thank you. It bothered me that the NY times obituary seemed to omit him from any art historical context and more or less was an introduction to his work. Perhaps done on purpose, as you know it's all just a political game they play. I appreciate your insight and overall understanding of his work. " "Anybody know much about Walter Chrysler? He gave much of his collection to the Chrysler Museum here, but refused to sign it all over at his death. He bought me coffee once. Peggy Earle has published a book about him. Apparently, he did not like to pay the workmen that helped him." 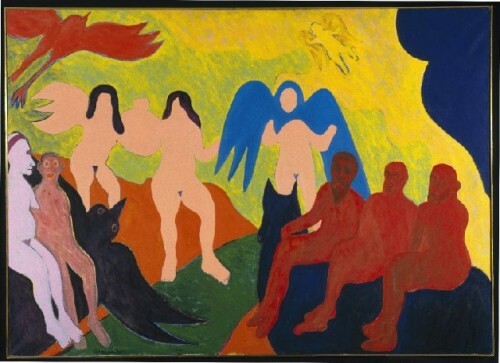 "
"For me I always saw Johnson as someone much indebted to David Park & to some extent Marsden Hartley; as seen in his clunky boxy figures and odd garish color palette. As for Johnson himself he received much praise and critical success in his long career. Certainly having a fan in Peter Selz helped him much. Fans of the Fig /Exp movement should read Marika Herskovic'c 2009 book on the subject. 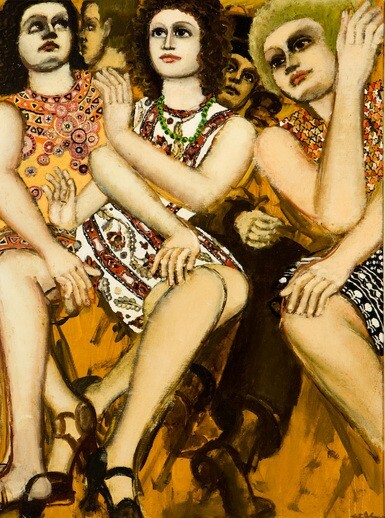 But in your essay on the Fig./Exp school movement you left pout painter Irving Kriesberg (1919-2009) a card carrying(and life long) influential member of that group. He also recently was deceased (last November) at age 90. 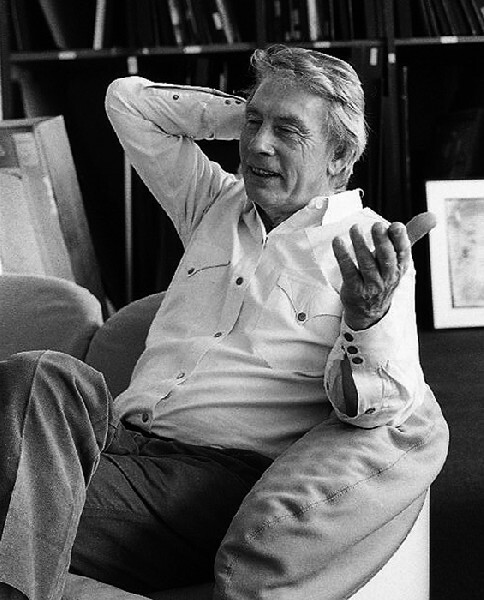 IK had a similar career as Johnson in terms of exploding onto the NY scene ('52: MoMA 15 Americans, Curt Valentin Gallery, Graham Gallery) and he & Johnson shared many friends & associations, teaching positions (Yale: '62-'69) and exhibitions. The one place IK never showed or at least very little was in Provincetown. Had he done so I think many important critics outside of NY may have seen him more. Still, he & Johnson respected one another for many years & remained in touch right up to the end. Writer Adam Zucker is I think an IK fan and may be doing some writing on IK's much overlooked but long & fascinating painting career"
"thank you...put johnson's work into perspective for me and I will see his figurative paintings, in n.y.yankee caps in a new light"
"Thank you for this look at Lester Johnson and an art-historical view of his milieu. I admire many of the artists you name as being loosely associated with Figurative Expressionism"
"i like the piece. you brought up an important point.that kind of figuration has been problematic ,not tidy.the east and west coast painters while having this figuration in common often had compositional differences. clem greenberg and i became close friends.actually he was not just into abstract painting. he felt that he got a bad rap was typed.this happens there was aturn against abstract painting and he got dumped on.i agree with your take on johnson and others. this needs further exploration. it doresn't have to be all or nothing. as a painter i have always preferred pollock to de kooning, however there are elements in dekoonig that i find useful.his gesture became too fascile and his colr is muddy. i do like him in black and white and for hispushing himself. jan mueller had a a special lyrical vision. basically i am on your team . there are ways to use nature without becoming programmatic. johnson and co deserve more investigation. "